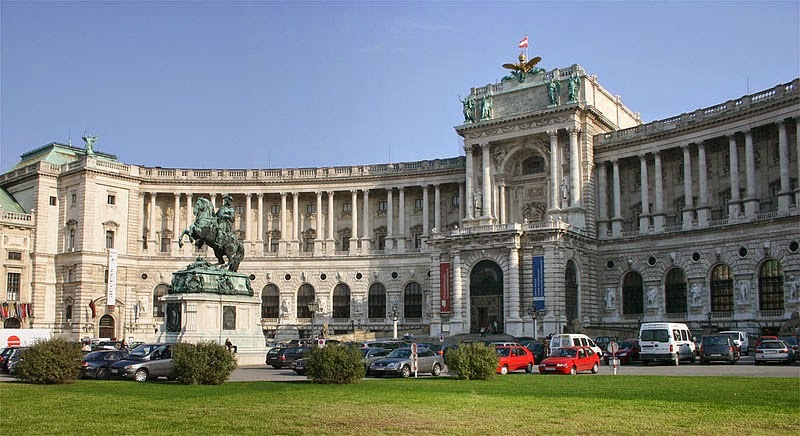 The scene is Vienna on the brink of the first world war, an epoch grinding to its tragic end. This blurb is a bit misleading actually, as the book never quite arrives at the beginning of the war, and very slowly and very thoughtfully meanders its way through 1913 Vienna. There is almost no action and very little sense of 'tragedy'. Anyway, I subsequently ploughed my way through all three volumes of this fascinating book, and I keep turning back to it, making notes and pondering over its content. There is an intriguing connection between the book and the first world war itself, which is sort of like an invisible yet palpable shadow which hangs over the entire work. 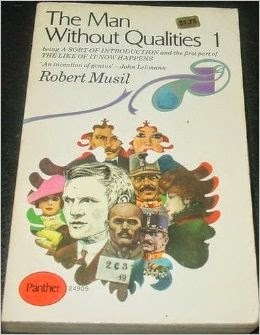 At the same time Musil is clearly involved in a much more general literary – philosophical project, and the book covers a huge and diverse territory of themes and topics. The subtitle of the second book, “Pseudo reality prevails”, is actually a debatable and possibly misleading translation of the original German. A more literal translation is “The Like of it Now Happens”. I'm no German scholar, but I still like the more evocative subtitle more than the literal translation. There is a very insightful article I read some time ago about this very issue, but searching the net proved fruitless. So I thought I would have a go myself, without recourse to the original German, of simply trying to come up with one possible reason why 'Pseudo reality prevails' is in fact a good translation, and some sort of account of what it might actually mean. I'm going to focus on the first chapter of the second book (chapter 20), which is described in the chapter blurb as “The touch of reality. Despite his lack of qualities Ulrich acts with ardour and resolution.”. Ulrich is the main protagonist of the story, he is a young man from a reasonably privileged background who has given up his academic ambitions and is leading a fairly leisurely existence, paid for by his father. His father has just written him a letter exhorting him to make use of his prodigious talents, and not let himself drift any longer. He is also a passionate patriot, and urges Ulrich to pay a visit to this friend Count Stallburg, a powerful figure in the Hapsburg Empire. Germany is planning big events for the upcoming 30th anniversary of Emperor Wilhelm II's reign. Not wishing to appear outdone by this, especially considering the fact that Austria's own Emperor has his own 70th anniversary approaching in the same year (1918), Stallburg is helping to organise a committee which will plan out this patriotic 'Collateral campaign'. Ulrich's father has recommended his son to Stallburg, and organises an interview for him. Chapter 20 describes this interview. That Ulrich decided to call upon Count Stallburg was explained, last but not least, by the fact that his curiosity had been aroused. Ulrich's confidence in himself and sense of self assuredness is increased further when the Count engages him in conversation. His opening question, about what Ulrich does for a job, is about as mundane and bourgeois as it gets. Ulrich explains his interest in Mathematics, and feels so comfortable that he lets his guard down completely and ends up making a crucial, and in the end quite enlightening, faux pas. To understand this embarrassing error we need to backtrack again, and introduce another important character: Moosbrugger. Moosbrugger is in jail awaiting sentencing for the vicious murder of a young prostitute. There is no doubt about his guilt, which he loudly proclaims, and actually cheers on the prosecutor when he describes Moosbrugger as being a "public menace". There is doubt, and a lot of debate, about his sanity. For Musil, Moosbrugger is both a figure who raises questions about criminality and sanity, and also a figure who stands as the subject of an intense scrutiny by society. Newspapers run hundreds of stories about him, there are huge debates about morality, the state of society and the nature of sanity, all focused on Moosbrugger. Moosbrugger himself is a lucid and vocal contributor to the debate around his crime. Even though he is poor and uneducated, he picks up various bits and pieces of psychological jargon and learned sounding phrases, which he intersperses into his own narrative. He confesses fully to his own guilt, yet describes his actions as being completely logical and inevitable outcomes of the pressures and forces impinging upon him from the outside world. Moosbrugger vehemently insists upon his own sanity, and takes a highly principled stand against any defence based upon the idea that he is mad. It even seemed that he was demanding to have his murder regarded as a political crime, and he sometimes conveyed the impression that he was fighting, not for himself at all, but for this interpretation of the legal situation. … he all at once began to behave as though he were at home here, following the trend of his own thoughts instead of the social demands of the situation. He suddenly remembered Moosbrugger. Here, right beside him, was the power to reprieve, and nothing seemed simpler than trying to find out whether one could make use of it. Then Count Stallburg gives Ulrich his letter of introduction. Ulrich is recommended to the leaders of the patriotic Collateral campaign as “a helper full of ardour and resolution”. The closing words of the chapter are worth quoting in full, as they effectively complete the humbling transformation of Ulrich from a self confident intellectual, mocking the institutions of the Empire, into a humiliated subject of his very own society. When Ulrich received this letter a few moments later, he felt like a child that is dismissed by having a piece of chocolate pressed in its little hands. He now held something between his fingers and received instructions concerning a further visit, instructions that might just as well have been a command as a request, without any opportunity occurring for raising an objection. 'This is all a misunderstanding, you know, I really had no intention at all - ' he would have liked to say, but there he was, already on his way back, back through the vast corridors and State apartments. He suddenly stopped, thinking : 'Heavens, it bore me upwards like a cork and washed me up somewhere where I never meant to go!' He scrutinised the cunning simplicity of the décor with curiosity. He felt quite safe in telling himself that it made no impression on him even now: it was merely a world that had not yet been cleared away. And yet what was the strong and peculiar quality that it had nevertheless made him feel? Damn it all, one could hardly put it otherwise than that it simply was surprisingly real. Ulrich has been co-opted, in a manner which reduces him to the status of a child, and completely denies him any sense of agency or autonomy. His somewhat arrogant and over confident pose has been shattered, and this is accompanied by a sort of revelation about the nature of the power and authority which has so cunningly taken him by surprise. It is significant, I think, that this is not an intellectual revelation. Obviously, his father exerts some power over Ulrich, and even more obviously the Imperial Palace is the physical seat of political power. Ulrich knows all these facts already – in fact they are too familiar. The jolt here is a “strong and peculiar quality” which makes him feel the effect of these power relations in a way he has not experienced before – hence the sense of surprise. This aesthetic experience of power manifests through the décor of the palace itself. The faded and shabby aristocratic glamour, the simplicity of the utilitarian furniture – mocked at the beginning of the chapter, now reveal a sort of hidden essence. The key to this humbling transformation, and its aesthetic revelation of power, is the criminal Moosbrugger. He is the dark and buried unconscious element which finds its way into the heart of polite and refined Viennese society, via the faux pas of Ulrich. There is never any question of success: Ulrich's plea will never be considered. Ulrich himself will become a part of the Collateral campaign, despite his scepticism and lack of faith in the political institutions motivating the patriotic movement. His social position is a trump card which he is forced to play, and the words describing him as a “helper full of ardour and resolution” are part of script which has been written for him in advance. The thought of Moosbrugger, and Ulrich's contemplative sympathy for him, somehow act as a catalyst for a psychological reaction which allows Ulrich to view the social world around him in a new light. This was an inconsistency. Ulrich sat breathless. This was clearly madness, and just as clearly it was merely the distorted pattern of our own elements of existence. It was disjointed and steeped in darkness. Yet somehow Ulrich could not help thinking: if mankind could dream collectively, it would dream Moosbrugger. Again, another parallel comes to mind: this inconsistency of Moosbrugger's is perhaps not dissimilar to the inappropriateness of Ulrich's plea to Count Stallburg. Just as Moosbrugger is frequently described in terms of 'earthiness', his skin building up layers of grime due to infrequent bathing, Ulrich's unsuitable words are “like a little clod of earth that someone had accidentally brought into the room on his shoes.” The faux pas functions as a quiet, embarrassed version of Moosbrugger's rude shouting. So what is this “reality” which Musil is trying to describe? I don't think it is simply the fact of the awesome power of either the judiciary sentencing Moosbrugger, or the Count Stallburg co-opting Ulrich into the patriotic campaign. These kinds social facts are obvious – in fact they are so obvious that we tend to be comfortable with them, and rarely even notice them. I think this is what the translator was trying to get at with the phrase “pseudo reality”. It is Ulrich's habitual and unreflective comfort in his social role which is radically disturbed and embarrassed by the faux pas regarding Moosbrugger. This error of judgement actually allows the veil to fall – the power relationships, the social code, and in particular Ulrich's own role within this context – all this is revealed to him suddenly, as Moosbrugger is swept under the carpet of polite discussion, and Ulrich is declared to be the exact opposite: a man of 'ardour and resolution'. iThere's another reason (I think) why Musil chooses this word. According to the Wikipedia entry for the Austro Hungarain Empire, the abbreviation K.u.K. 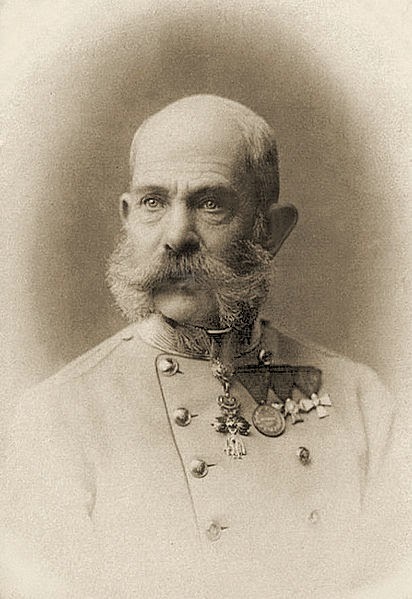 , for Kaiserlich und Koniglich or “Imperial and Royal” was common throughout many Austro Hungarian institutions. 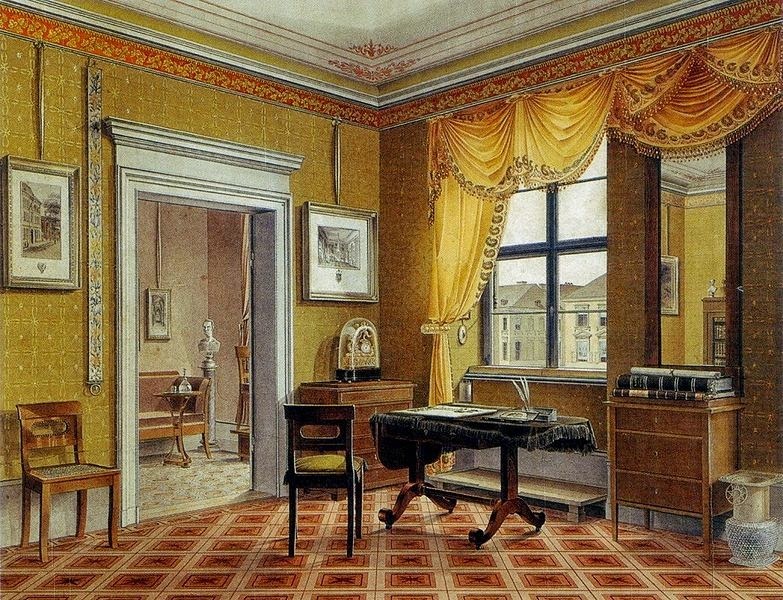 The Biedermeier period does not refer to the era of time as a whole, but to a particular mood and set of trends that grew out of the unique underpinnings of the time in central Europe. There were two driving forces for the development of the period. The first was the growing urbanization and industrialization leading to a new urban middle class, which created a new kind of audience for the arts. The second was the growing political oppression under Clemens Wenzel von Metternich following the end of the Napoleonic Wars. The restrictive policies led artists and the society in general to concentrate on the domestic and (at least in public) the non-political. 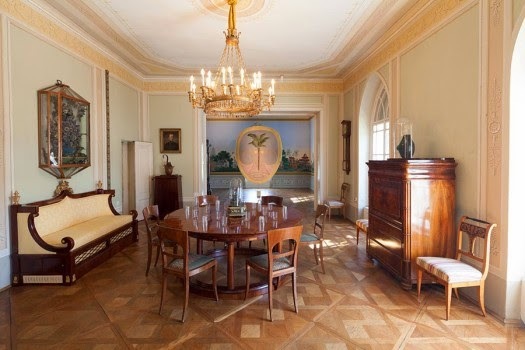 Writers, painters, and musicians began to stay in safer territory, and the emphasis on home life for the growing middle-class meant a blossoming of furniture design and interior decorating. iiiThe name “Stallburg” translates into “Stables”. So I think – and I could be wrong about this – that Musil is again taking the piss. The description of Stallburg as looking like an orangutan would be consistent with this 'horselike' description.